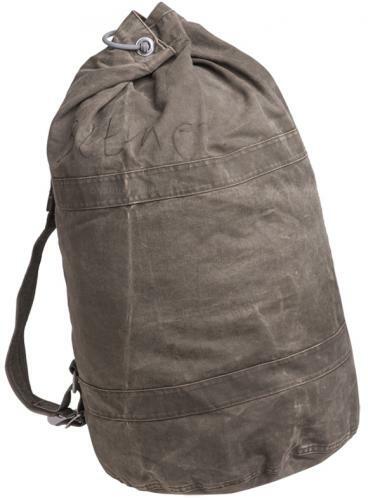 If you are after a proper ol' duffel bag, try this German model. Large, made of strong canvas and surprisingly nice to carry for a bag of its size thanks to the shoulder strap system. Closed with the traditional "shish kebab way", piling the grommets on the locking piece and closing it. Unfortunately we can't promise you will get the lock, but any cord or rope should be enough to fill the purpose. Measurements flat about 65 x 80 cm. Weight 1,5 kg - as said, no flimsy canvas on these. Volume? Well... maybe about 100 litres? Used and abused, but in serviceable condition. Toimii!! Kerrankin kunnon säkki johon mahtuu kamaa just niin paljon, kuin haluaa! Ei tarvii niin tarkkaan viikkailla ja asetella, senku mättää menemään! Ja ei oo mitää pilipali vetoketjuja jotka heti hajoo... Kestää ja toimii! Ei ehkä pidempään kantamiseen selässä, mutta sehän ei ole tarkoituskaan tällä vehkeellä. Omassani tuli lukitusrauta mukana, joka osaltaan helpottaa käsittelyä. 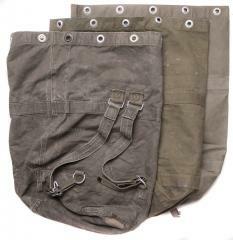 Classic dufflebag (or Seesack, as we call them in Germany). Wether you are mooving, need a bag to ged rid of a body or play sack race with your pals, this trusty pice of equipmetn will never let you (or your stuff) down. When packing up your stuff do not worry about needly folding your clothes, it will come appart annyways. Simply drop your stuff in, close it up and you are good to go. Pro tip: tie the lock to the bag, they tend to get "lost". It has quite a vintage look to it and will hit the taste of Hippsters on spot. Want to make a statement? Consider writing messages and statements on it.